August 19, 2018: Summer season is at its peak in the UAE and Saudi Arabia with August hitting average temperatures between 40 – 45 degrees celsius. More than half of the population (57%) in these countries makes changes to their eating habits and takes extra care of their skin and hair in response to the soaring temperatures. From keeping themselves hydrated, choosing a cab over walking on the hot streets, staying indoors and reading a book or visiting a mall, people find many ways to get some respite in the heat. 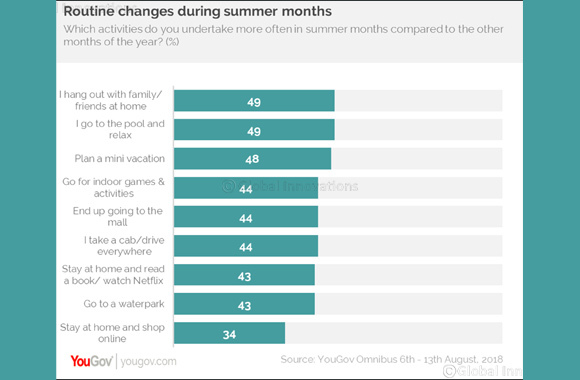 One in two people in both the countries prefer hanging out with family and friends at home or like to relax by the pool. 48% people plan a mini vacation to dodge the heat, the number being higher in KSA, where 53% agree to take a vacation compared to 43% in UAE. While in UAE (48%) people are inclined to visit their home country for a vacation, in KSA, they (44%) prefer escaping to a colder country. Drinking lots of water and fresh juices over carbonated beverages seems to be the obvious choice for people to keep themselves hydrated, with 51% respondents saying so. Close to 60% in UAE and 43% in KSA make this change to their routine. Around two- thirds of people eat lots of fruits and vegetables like watermelon, cucumber, etc., to keep themselves cool. As an added precaution, close to half (46%) indicated that they dine out less often during summers, while half of the respondents (51%) said they cut down on oily & spicy food. 5 in every 10 respondents shift to exercising indoors in the harsh weather, more in the mornings than later in the day. A considerable proportion (43%) prefers to go for a swim to unwind and feel refreshed. While staying hydrated and eating right is the most important thing to do, people also make changes to their skin and haircare regimen. 5 in every 10 respondents said they use more sunscreen /sunblock lotions during the not so balmy days. In terms of their appearance and look, 44% people mentioned they like to keep it basic with no make-up and opt for a shorter hair cut to relieve themselves. Both men (52%) and women (37%) indicated making this change. However, the proportion is higher in KSA, with 52% choosing to go sans make-up compared to 37% in UAE. Although the summer season is at its peak right now, there are always ways to beat the heat.